This was one of the number of bubblegum acts put together by producers Jerry Kasenetz and Jeff Katz. From the start this was more of a 'project' rather than a single band. Beg, Borrow Or Steal was recorded by The Rare Breed. The outfit that first went on the road as Ohio Express was another Mansfield, Ohio group Sir Timothy and The Royals, led by Tim Corwin. They were involved in many of the earlier studio recordings and Corwin stayed on through later personnel shifts. Other early tracks were recorded by the Measles (who included Joe Walsh and were later known as Lacewing), before Levine took control of the project. They are best remembered for their hits Yummy, Yummy, Yummy and Chewy, Chewy, which were typical of the bubblegum genre (heavy repetitive bass beat, simple lyrics and nasal vocals), but they also enjoyed several other minor hits. 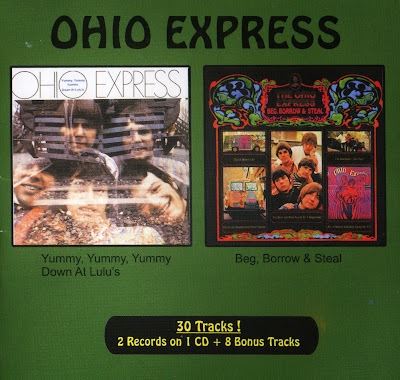 Two of their albums made the Top 200:- Ohio Express (which included Yummy, Yummy, Yummy climbing to No. 126 and Chewy, Chewy peaked at No. 191, but bubblegum music really aimed at the singles market. Their first seven 45s were sung and written by Joey Levine, who was on Buddah's staff, but Buddy Bengert was lead singer on Pinch Me and Graham Gouldman (later of 10cc fame) performed the vocals honours on Sausalito (Is The Place To Go). On their eponymous second album whilst the studio musicians performed songs like Yummy Yummy Yummy and Down At Lulu's, they left the rest of the material to the band pictured on the cover. Tucked away on this album are some very pleasant surprises. For fans of pop-psych with beautiful harmony vocals, She's Not Coming Home is simply exquisite and the breezy pop of Winter Skies may appeal too. Into This Time has a great psychedelic guitar ending, First Grade Reader showcases a harsher side to their music - it also features some fine guitar work. Turn To Straw is a superb slice of psychedelia and the jewel in the crown is garage-popster The Time You Spent With Me which contains some great psychedelic guitar passages.